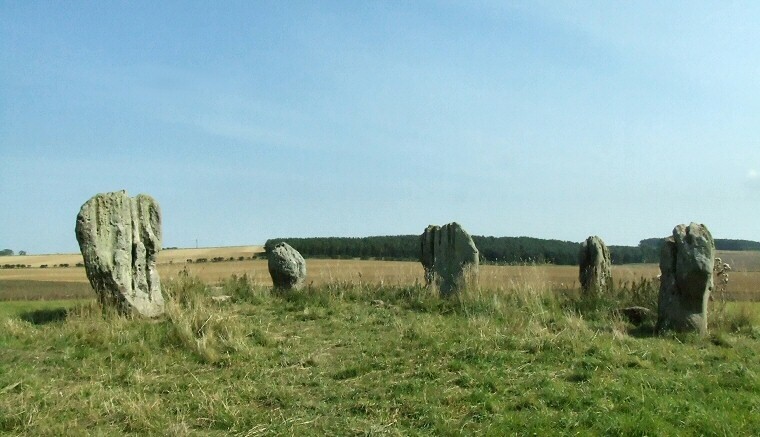 Looking west over Duddo stone circle towards the Scottish border. 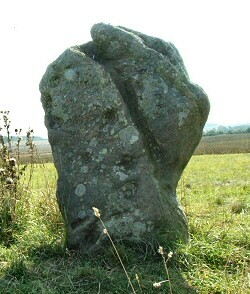 Although shown as 'Duddo Four Stones' on the Ordnance Survey 1:25000 map there are in fact five uprights in this stone circle. The OS seem to have kept the descriptive 19th century name of the site but the re-erection of a fallen stone at the beginning of the 20th century means the circle is now more usually referred to as 'Duddo Five Stones'. 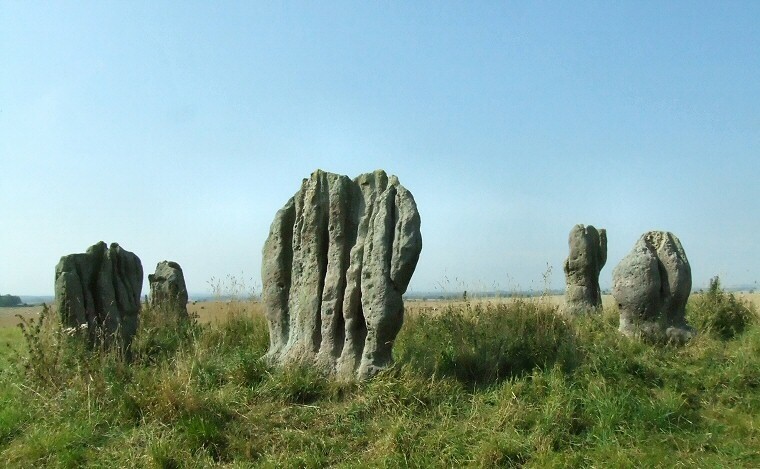 There were in fact once seven stones in total, a large gap to the west that can be seen in the foreground of the photograph below was occupied by a pair of stones whose sockets were discovered during excavation in the 1890's, the missing stones having been removed at least 50 years before. Due to the soft sandstone chosen for the uprights the stones have become highly figured from the effects of 4000 years of Northumbrian weather with deep water-cut channels running down their faces and despite the physical bulk of the stones with the tallest standing 2.3 metres high, the circle is quite compact with a diameter of just 10 metres. Surprisingly given the amount of erosion on their surfaces, or perhaps because of it, several depressions in the stones have been interpreted as cup marks - the middle stone in the top picture has a vertical line of possible cups towards its right hand side while the inset image shows the inner face of another stone that has several large bowl shaped hollows that could either be man-made or natural. Duddo stands on slight saddle between the slopes of Mattilees Hill to the east and a slight rise to the west with the landscape falling away gently to the north and south but the most impressive views sweep round from the north to the west in the direction of the border with Scotland only 6 kilometres (4 miles) away. View of Duddo looking towards the east.